Matchbox 20 entered in 1996, shocking critics by selling more than ten million copies of their debut album, "Yourself Or Someone Like You". For their next album, they've changed their name, their music's changed genres from alternative rock to adult contemporary and...in short, they've matured tremendously as performers and as songwriters. Mad Season is a masterpiece. Every single song on this album can be singles, there are no fillers. 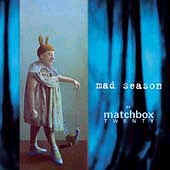 From the power-pop of "Angry", "Stop", "Black and White People", and "Crutch", to the dreamy guitars and vocals of "Last Beautiful Girl", "The Burn" and "Bed Of Lies", Mad Season is a wonderful experience through the distinctive, melodious Matchbox Twenty sound. Rob Thomas, the lead singer, has an amazing vocal range, which lends a hand to the slow jams on the album, especially on "If You Are Gone" and "Leave". And all of this leads to the first single of the album, and it's probably the best song off of the album. "Bent" is lighting up radio stations everywhere, making people just sing along. All in all, this is a must-have for your collection if you an alternative rock or pop fan. Trust me, you won't regret buying it.